Sometimes you just want it, right? Foods from your childhood or past that make you feel good? For me, one of those foods is spaghetti. Nothing fancy, nothing that takes hours to make. Just plain ol' spaghetti that sticks to my ribs and puts a smile on my face. Today, I wanted spaghetti. And since I keep a pretty well-stocked pantry, I didn't have to go anywhere to buy ingredients. That was nice. I have no plans to go anywhere at all this weekend since I've spent the past 12 of 13 days away from home. So knock around in the pantry I go. Here is the sauce I cooked up. Coat bottom of pot with olive oil. Saute onions (with salt) until clear. Add minced garlic and lower heat. Don't overcook garlic. Add crushed tomatoes and herb cubes. Bring to simmer. 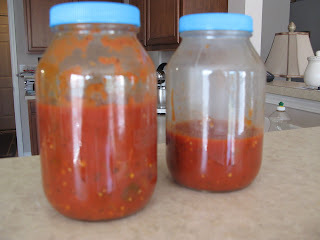 Add both cans of tomato paste and 3-4 cans of water. Stir and simmer. Add sugar and spices to taste. Lower heat and simmer. In a separate pot heat salted water. Add a dash or two of olive oil. When boiling add spaghetti and stir so it won't all lump together (however much you think you'll need...the sauce is enough for a whole box but if you don't want to cook that much, do less.). When al dente, drain spaghetti in colander. 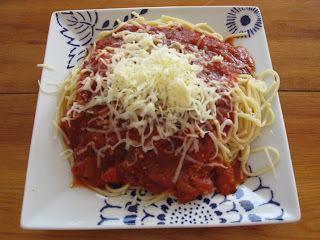 I put a thin bed of Parmesan on the plate before I put the pasta on the plate, it helps to stabilize the pasta and keep it from slipping around on the plate. 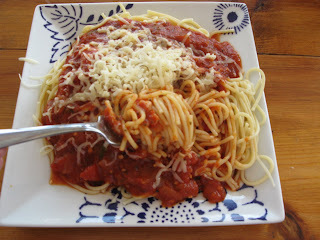 Besides, you also get a nice Parmesan surprise at the bottom of the dish. Then sauce. Top with more Parmesan. I went back through and think the herb cubes are from your Sept. 28th blog? Is that three cubes each of the basil and parsley? If we don't have the frozen, can you give me an estimate of how much that would be otherwise? If you're using fresh, I'd just chop up a few sprigs and toss in. If using dried, maybe a teaspoon to start and then add more to taste. You can leave out the parsley if you don't have it, of course. I tend to make do with what I have. I often don't have parsley and more often than not, used dried herbs, because it's there! My few cubes of frozen were kind of nice because I grew them in my garden.